DC Comics has really reversed its creative slump during the last few months. Wednesday Comics, Batman and Robin, Flash Rebirth are quality comics. And of course, leading the way are Blackest Night and Green Lantern. 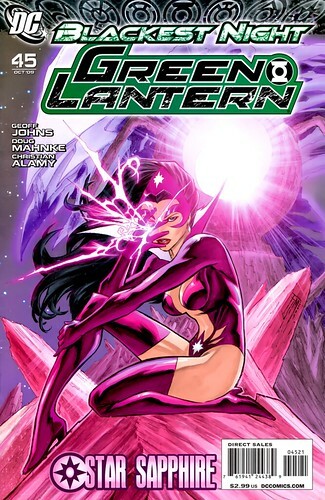 Green Lantern #45 veers away from Hal Jordan (while he is the spotlight in Blackest Night) to focus on Star Sapphire, Sinestro, and his fear-mongering corps on the Zamoran homeworld. This story really struck me as to how far Carol's character has grown. 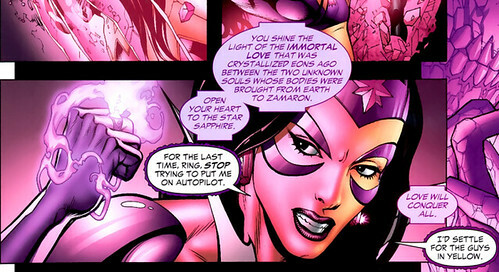 In her early appearances as Star Sapphire, Carol was obsessed with Hal Jordan--to the point of battering down his resistance to becoming her mate! The purple ring pretty much brainwashed Carol, who only reverted to her normal persona after being defeated in battle. There's great subtext in all of this depending on which decade you read the stories. In the 60s, it was about women's liberation and having the power to get what they wanted--only to have a man take it away! Especially in the scene above (from Green Lantern 74, 1970) where Star Sapphire battles not only Green Lantern, but Sinestro as well. Now in the current Green Lantern series, Geoff Johns has done a lot to explain why Carol has acted so crazy over the years. The sapphire ring is so dominating to the bearer that they do become brainwashed. Only Carol is able to resist the power, as she has had the most experience with it: "Stop trying to put me on autopilot." 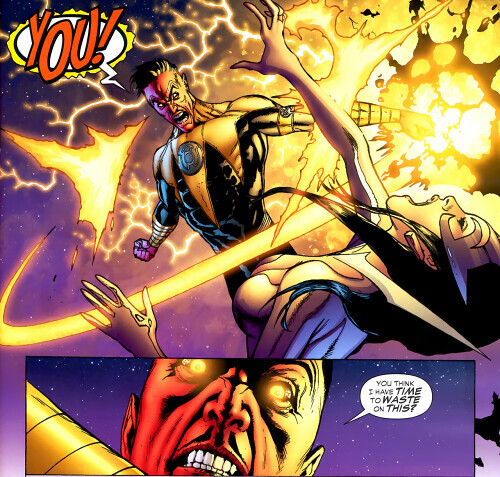 As the cover promises, Carol throws down against Sinestro after he breaks free of the Zamoran purple prison. I take some disagreement with Sinestro's statement ("I have never sought revenge against my former pupil through, you Carol...") because obviously he has done so. But you have to think that Carol is terribly overmatched in this confrontation. I had Bullseye/Elektra jitters all over again. Fortunately, Carol's ring has a power more potent than creating purple constructs. She traps Sinestro and causes him to remember his own lost love, who turns about to be the sister of Abin Sur! Perhaps this has been established elsewhere, but it was the first time I knew who exactly he had married in the past. With the recent revelation that Sinestro is the father of Soranik Natu in the Green Lantern Corps--Sinestro's story just keeps getting more wondrously complex. We still don't know exactly how Arin Sur died...or at least I do not. Was it from Sinestro's own hand, a la Darth Vader? John Siuntres just speculated in a recent Word Balloon podcast that Sinestro might actually be "the greatest Green Lantern of them all" if somehow he turns around during the Blackest Night conflict. It's possible, but I hope that Geoff Johns doesn't try to totally change Sinestro...he's just too much fun being evil. Nuff said.